A group of young German men who are encouraged by their teacher to enlist at the beginning of WWI, find that the harsh reality of being a soldier isn't what they anticipated, as they witness and experience death, fear and pain all around them. 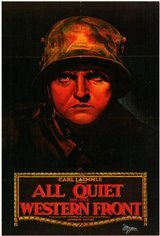 Adapted from the novel by German author Erich Maria Remarque. Winner of the Best Picture and Best Director Academy Awards.